Extremists unleashed a thunderous barrage of mortars or rockets Tuesday against the Green Zone, killing at least three people and wounding 18. One of the dead was an American service member. The barrage of an estimated 20 projectiles crashed into the Green Zone about 4:15 p.m.
A U.S. Embassy statement said the dead included one U.S. military member, an Iraqi and a person of unknown nationality. The 18 wounded included five Americans - two military and three contract employees, the statement said. 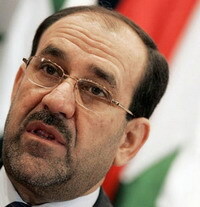 Prime Minister Nouri al-Maliki warned gunmen a week ago to stop firing rockets and mortar rounds into the Green Zone. Many of the mortar attacks come from the Mahdi Army, a militia loyal to anti-American cleric Muqtada al-Sadr, who was once al-Maliki's ally, though Sunni insurgents have also carried out mortar attacks.